I have started to use PETG for the first time with my Ultimaker 2, 3D printer. 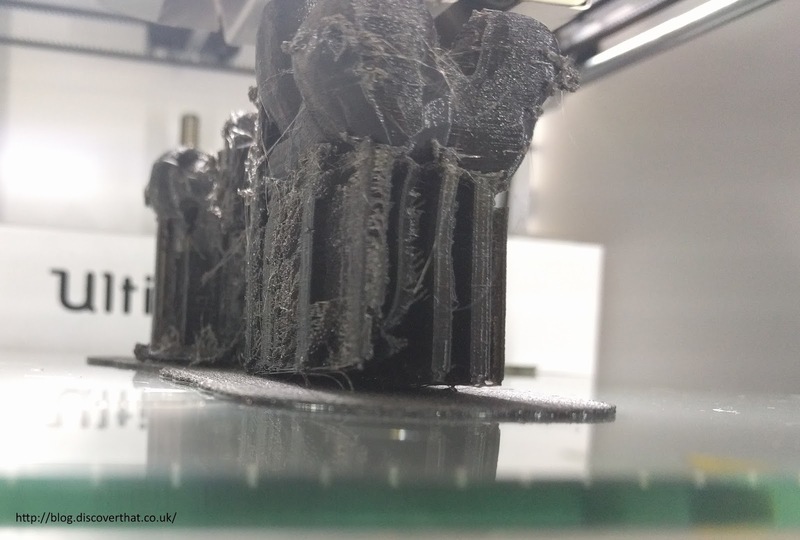 Apparently it can be tricky to print with and needs experimentation to get the right settings. 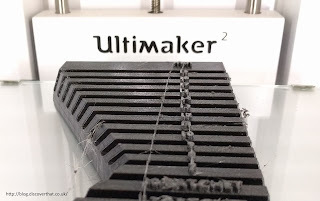 For those of you who are reading this to find a solution to avoid large prints from warping, I still find each print is a risk but I have had some good results. As far as I can tell no one has found a completely reliable solution. I am hoping that PETG will produce some strong prints. 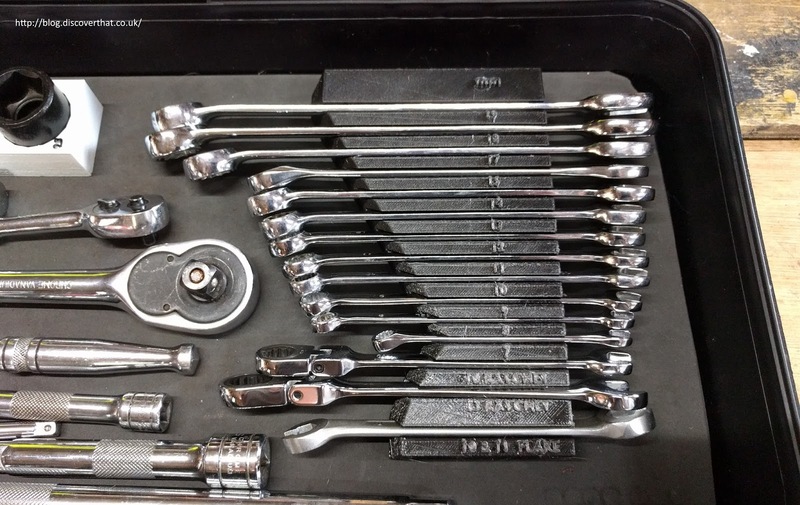 Until I've had a few bits in use for a while I won't know how robust it is. So far I can tell it is a bit more flexible and needs a bit more cleaning up than PLA. The PETG I have used has a tendency to leave a bit of fine stringing more like hairs and a few blobs. The hairs are easy to clean off but it still has other drawbacks. 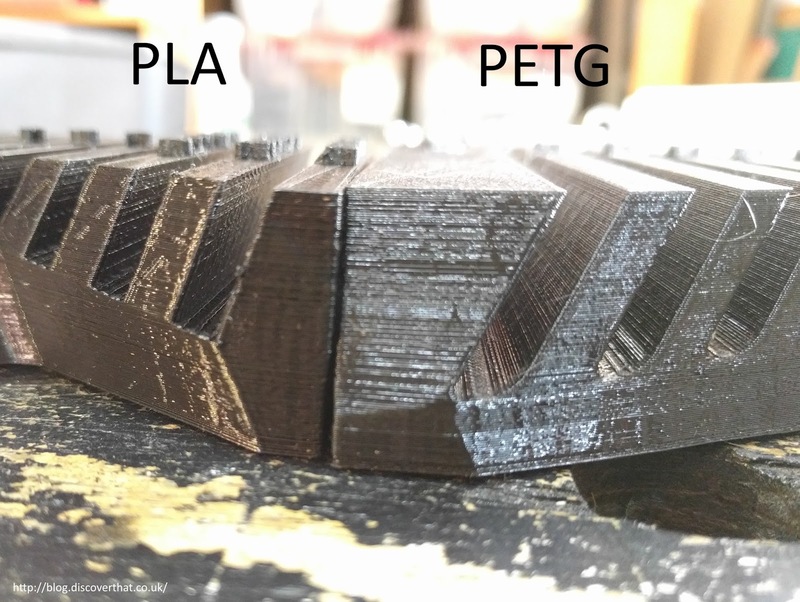 The two drawbacks with PETG are warping and blobs. The one that I have got to acceptable levels is warping. Not perfect but acceptable. The bigger problem for me are the blobs. For a while I was reluctant to print long running jobs using PETG and I am still a little nervous. I was getting offsets at random points in the print. 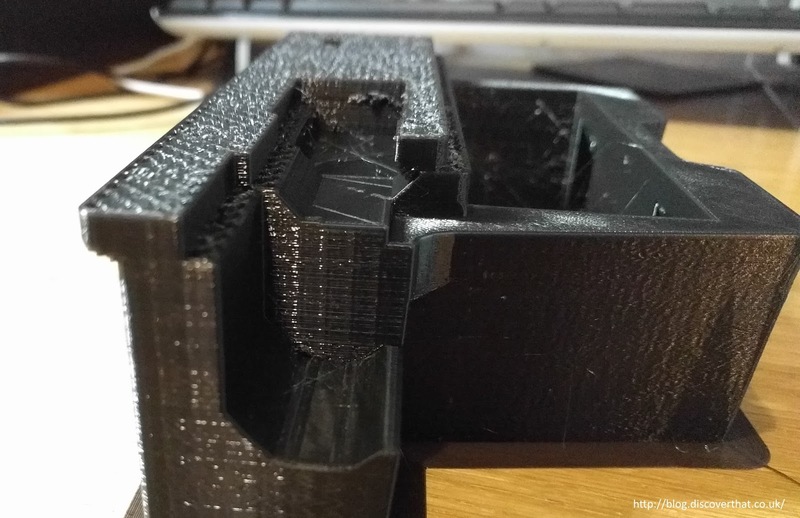 I am fairly confident but it is difficult to confirm, that it is a hard blob of PETG that the nozzle gets stuck on. 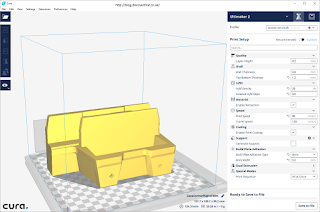 If I print no faster than 30mm/s I am most likely to get a successful print but the most important thing is to use a nozzle that has only ever been used for PETG. These settings have given me the best results so far. The brim is not always needed. The important bit to minimise warping is that the object needs a lot of surface area on the build plate in proportion to it's Z height above the build plate. 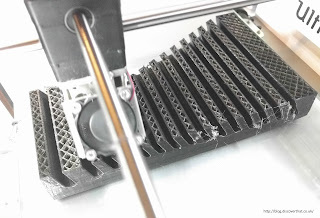 The main things are a hot build plate with no fans to cool the hot extrusion. I have not found a way to completely stop the blobs but swapping nozzles so that the nozzle used for PETG has only ever been used for PETG has made some improvements. 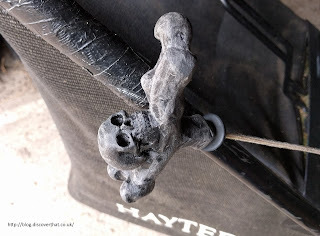 For quality and ease of use I prefer printing with pure PLA. 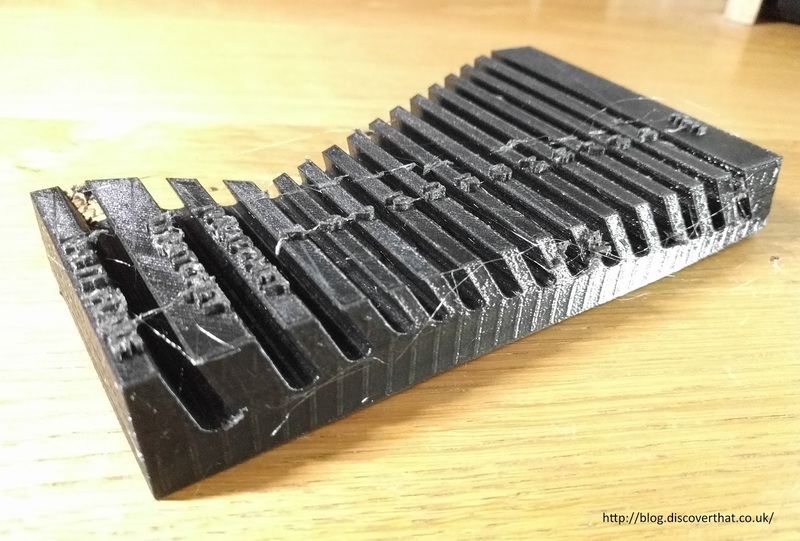 Some of the hybrid PLA's have some advantages but typically I find they also have some disadvantages. Lower quality or a slight tendency to warp depending on the mixture. To avoid keeping a massive stock of different types I mainly use one of the PLA mixes that is a little stronger than pure PLA. I'm only going to use PETG when I need the extra strength. 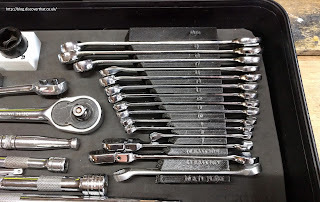 This post records the settings I have tried and some of my thinking to get to the above conclusion. My first print with PETG is off the printer after 11 hours. It says it's opaque black but, on the build plate, it looks a more translucent green. It's finished a bit black but not as black as the PLA. The filament on the reel looks black. A lot more flexible than PLA and a much smoother surface on the real. I struggled to find a temperature to set the build plate, so I've taken the view that as the glass temperature and the nozzle temperature are hotter than PLA the temperature for the bed for PETG should be a bit higher. PLA worked well for me at 60C so I've started a bit higher than that at 70C. The result is a little warped. Not much but I'll reduce the temperature and add a brim to see if that helps. The hot end temperature was simply in the middle of the range specified for PETG. That was the easy choice. The result is a bit stringy. After a bit of tidying up the result is similar in quality to PLA. I found very mixed information about the fan speed. The most reliable sounding source suggested start off with no fan and change to 100%. I've split the difference for now and set it to use 50% for all the print. The layers appear to have joined well, so I think the 50% is OK. 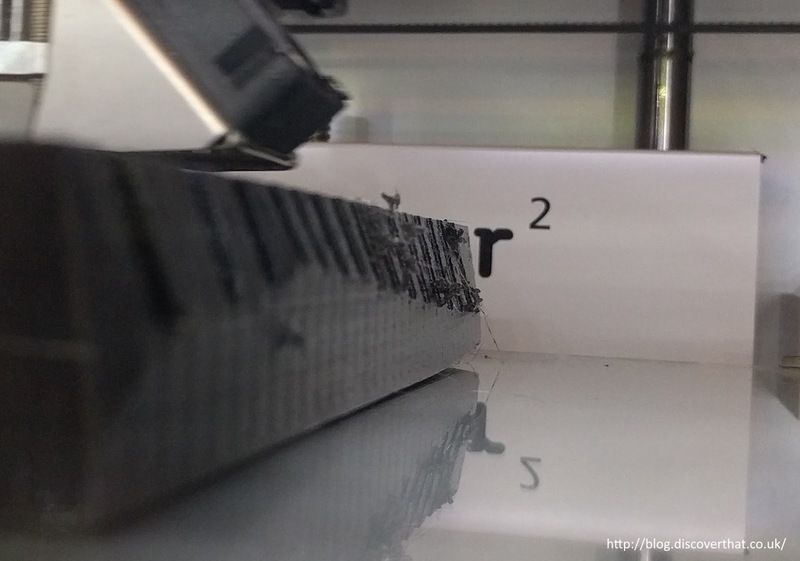 The same source suggested not printing too fast. I've therefore reduced the speed to 60mm/s for now. That felt a bit slow so I'm going to try a bit faster for the next print. It was also mentioned about leaving more gap between the head and the build plate. About an extra 0.02mm or thereabouts was suggested. As that is a bit awkward to keep changing between materials, I've tried it without moving the Z height of the bed. I have not had any issues leaving the hot end Z height unchanged. 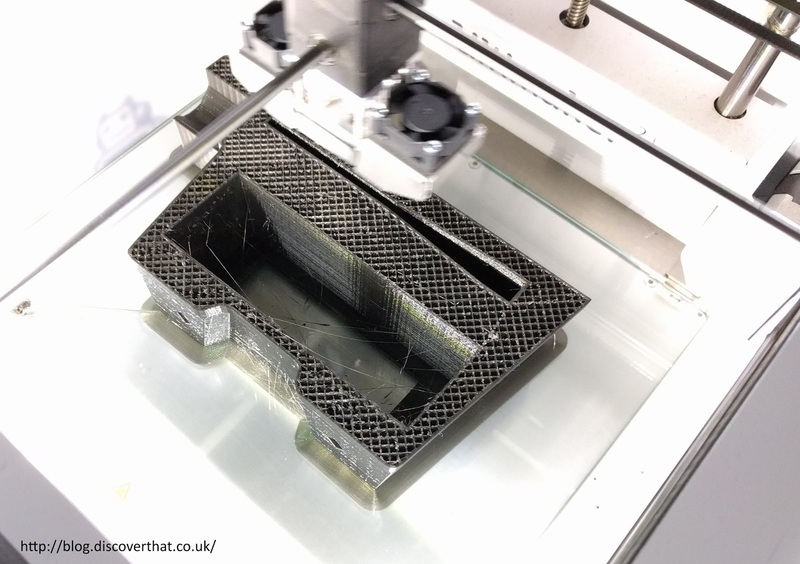 One of the features of PETG is that it has no odour while printing. I can confirm that is the case. Let's hope the advertised strength is as described. It could be the perfect printable plastic for me. The lower bed temperature warped even sooner. After about 5mm in height it had a noticeable curl at one end. I stopped that print it was so bad. I've adjusted the bed temperature up above my original setting and restarted. Same warping. 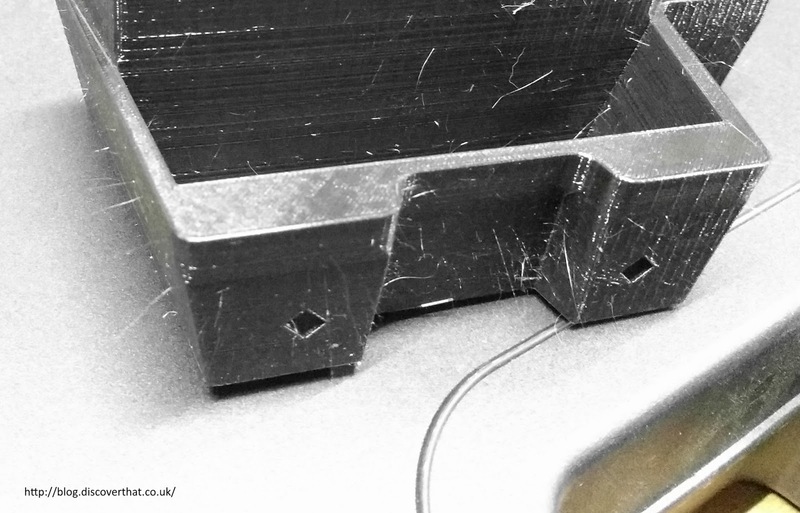 If the object is over about 80mm long on any edge, one corner or end will warp away from the build plate! In this case the brim remained mostly attached to the bed and only the model body warped. It warps all round at the edges but it tends to be minor on most edges and only on a large object does the warp become excessive. I tried the same setting but with a raft instead of a brim. Same result. The raft is nicely attached to the build plate but the rest of the model has warped away from the raft, just at one end, like all the other prints. Some of the discussion I have read on forums have mentioned that cool areas caused by unintended fans and drafts may be affecting the warping. In my case the location of the shrinkage on my build plate is not the same each time. I have therefore ruled out extraneous drafts as the ultimate cause with my setup. The location of the warp on the models I have tried depends on the shape of the item not on the position on the build plate. Despite what people are claiming none of them have a solution for the size and shape of the models I am printing. Most people are trying small test prints or that only have a small area touching the build plate! At least one of the pictures I looked at that claimed not to have warped was of an object that only had a small footprint and I'm fairly sure I could see the start of the warping on the edges of the area that did touch the build plate! Just in case you have not noticed. I do not use any glue or tape on the build plate. I keep the glass clean using a chamois leather. Adhesion may have a part to play but I'm working on trying to minimise the shrinkage rather than trying to force the object to stay put. In fact, the raft I tried remained attached to the bed but the model pulled away from that, I'm thinking that adding gunk to the glass is not going to help! Next attempt, the fan speed. This has just about worked. Just the tiniest pull up from one corner. I have changed the model to have more surface area on the bed at the point it tended to warp so this is not a scientific test. A hot bed plus no fan appears to be the solution. I need a few more successes before I call this a final result. When I swapped back to printing with PLA I had a few problems. The filament came out a bit lumpy and the second print got pulled off the bed. On closer investigation I found small pieces of PETG mixed in with the PLA. 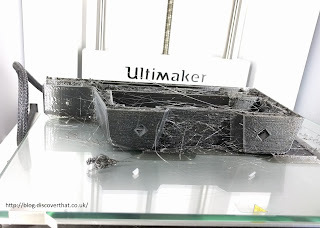 My guess is that the PETG was on the outside of the extruder end and bubbled up , eventually it was pushed off in small lumps by the new filament. I suspect the same is happening inside the nozzle partially interrupted the flow of the PLA. I've experimented and changing the filament a couple of times to help clean the nozzle helps a bit. 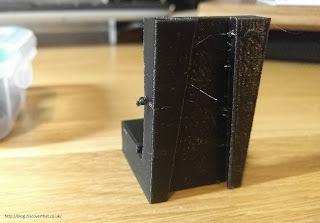 I'm not sure it's a complete solution but the prints are reasonably OK now. PLA completely stopped flowing thorough the nozzle. I could load the filament and it would flow while changing but when printing, the filament just stuck completely. 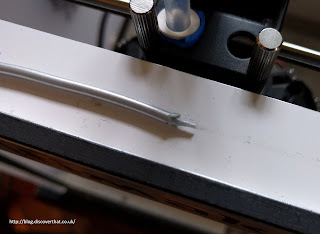 The hot end of the filament bulged out. My best guess is it is not flowing through the nozzle quickly enough because there is PETG in there that is not melting at the lower temperature used for PLA! The PLA just jams in the Bowden tube because of the bulge! Having only used PLA before, I am not used to having to clean out the nozzle beyond changing the filament a couple of times to pull out any old stuff. I have not had time to sort this out but I have decided an Olsson block would be very handy, if I'm going to use different filament types. 20 July 2017, I've upgraded my printer. 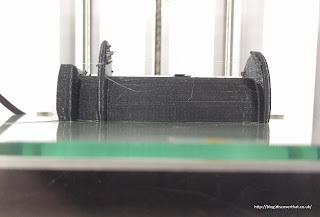 I've had a couple of successful prints with minimal shrinkage so I am going to make some very minor adjustments to see if I can improve on the blobbing and stringing without making the warping worse. The blobs and strings do not harm the result but do make for more cleaning up. Just a touch lower temperature for the extruder. The result was much the same. Perhaps a little more fine string but perhaps smaller bobbles. The difference was so marginal the one test is not sufficient to be sure there was any difference. At a guess I'd say it's not as strong so I'll probably revert back to 240C. Again there was just a little bit of warping on one corner. What I did note was that the contraction causing the warping happened AFTER the print had finished. I could hear it shrinking as it cooled! The implication is that no matter what the print settings are there is always going to be a risk of warping. I've had a lot of failed prints with PETG over the last week. Having made numerous adjustments, checked the rails and pulleys and that the gaps are set as they should be, I have concluded it is PETG specific. I've gone back to PLA and the prints have been fine. My best guess, from reading details on the Internet and looking at the results as best I can, is that blobs of PETG are setting solid and the head gets caught on those causing an offset in the layer from that point onward! I believe that PETG builds up on the nozzle and at a random time leaves a blob on a layer. It only needs a small amount to be in the way. The PETG sticks so well and is so hard when cool that the stepper motors cannot push past. It is very frustrating when this happens on a print that has been running perfectly for 10 hours and is then ruined. I've decided to only use PETG on quicker prints and, if necessary, split larger models in to sections to avoid all the wasted time and plastic. In my testing I tried adjusting the bed height. I can confirm that this did not work. The PETG needs to have the bed set the same distance from the nozzle as I use for PLA. If it is too far away it does not stick to the heated bed and I get a mess at some point, usually on the first layer! 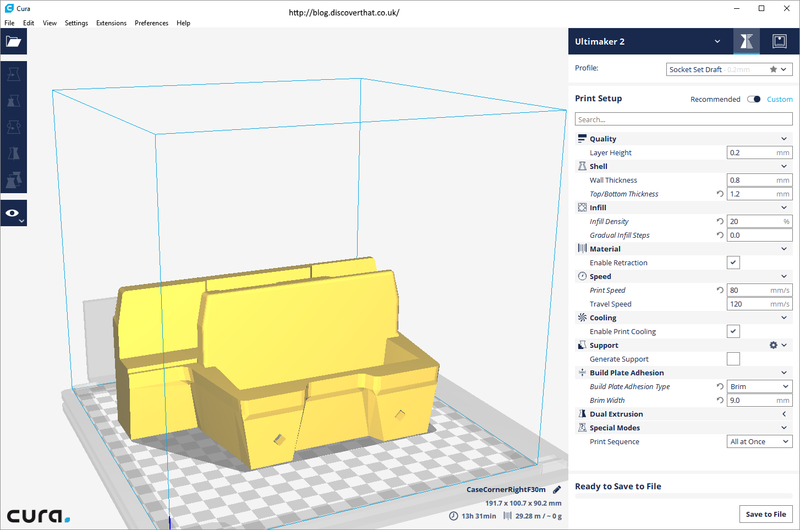 Another thing to note is that when I tried the same model in PLA I got a similar amount of shrinkage, so I have managed to get the PETG settings to produce comparable results to the PLA for warping. 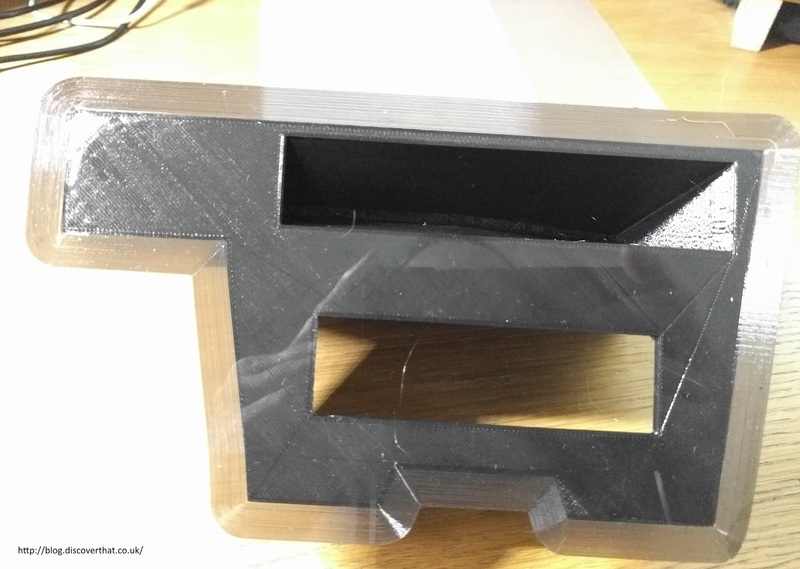 I've been struggling with layer adhesion and under-extrusion. Most of the under-extrusion is unrelated to the PETG settings but the layer adhesion is simply because I am printing too fast and too thick. 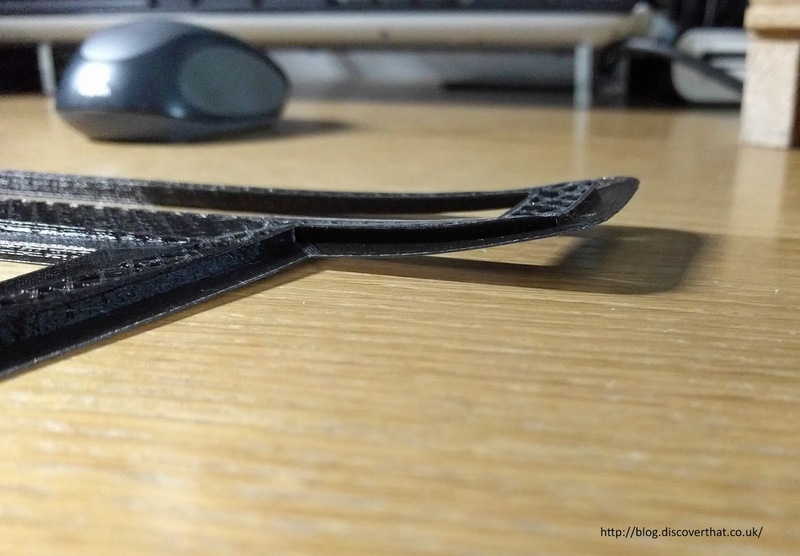 For smaller objects I have been getting some stronger results at 30mm/s with a maximum layer thickness of 0.15mm. 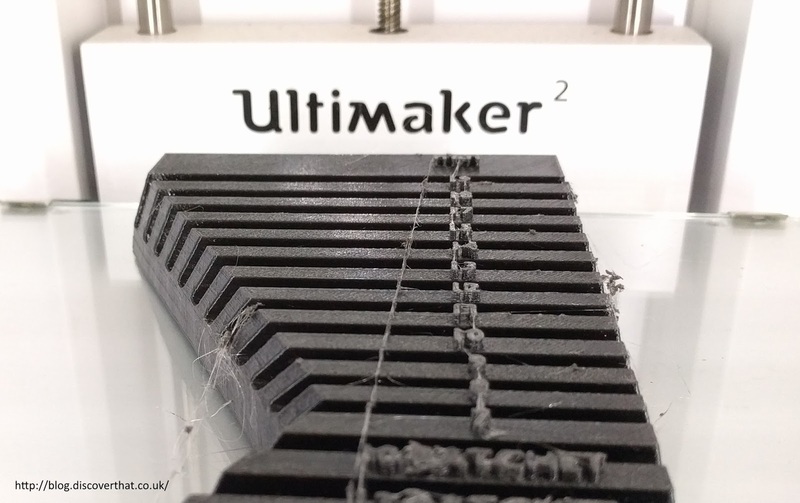 The upgraded Ultimaker 2+ has removable nozzles. If I only use PETG in a nozzle, I get fewer and smaller blobs. 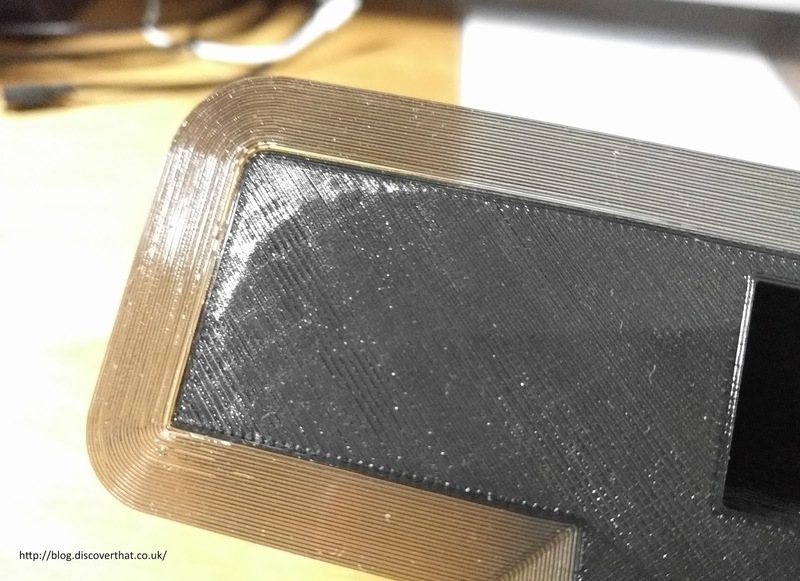 This makes me think that the blob issue is caused by very slight contamination from PLA residue in the nozzle. I now keep track of what nozzle is used for what and swap the nozzle when I change filament type. I am getting better results.